TADF developer CYNORA announced that it will present its latest deep-blue TADF emitter material at the OLEDs World Summit which starts today in San Francisco. CYNORA's latest material specification was presented in May 2018 - with a CIEy of 0.14, EQE of 20% and a lifetime of 20 hours LT97 at 700 nits. 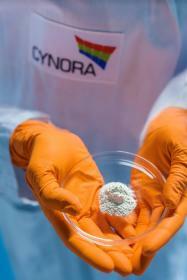 Cynora expects to have blue material in mass production by 2020, and when its deep-blue material is ready it will start to develop the less challenging highly efficient green and red materials. Last month we interviewed Cynora's CMO Dr. Andreas Haldi - who talked about TADF, lifetime, color points and more.